Following the success of their Spring 2015 tour, James Thomson is joined by The Strange Pilgrims; with Craig Rattray on bass, Jason Lowe on steel/lead guitar and Tim Burns (ex-Perry Keyes) on drums. The Highway Nights tour will take the band to new cities and towns along the East coast from Brisbane to Melbourne, kicking off on Friday February 12th at The Rails, Byron Bay. One listen to Ironsight confirms that country rock oughta have its own commercial designation, rather than being lumped alongside modern country artists. While Handasyd Williams and the Primitives wear their country influences proudly, they’re following an outlaw tradition steeped in renegade anti-glamour, glorying in unabashed big ideas and unhinged electric guitars as much as fiddles and mandolins and eschewing the rum and bubblegum post-pop of the mainstream country music variety. After a very successful run of shows as part of his ‘Careering Through The Wilderness 1995 – 2015’ tour (which culminated in a full house for his Sydney show), Jamie Hutchings returns to The Camelot Lounge in solo mode on Thursday August 27th. For long-term fans of the Australian independent music scene, Hutchings has been a constant high quality fixture. He fronted Sydney group Bluebottle Kiss throughout the ‘90’s and ‘00’s, his acclaimed solo work has been both stark and adventurous, whilst in recent times, his new group Infinity Broke have blended hypnotic, pummelling rhythms with barbed wire guitar and have proven to be a sonic feast for lovers of raw experimental rock. They recently released their second album Before Before. Joining Jamie as special guest is none other than his younger sister – pianist/composer Sophie Hutchings. This marks the first show the siblings have played together in a number of years. Joining her will be cellist Peter Hollo (Fourplay, Raven) for a stirring set of improvisational pieces. Hutchings has prompted much critical praise worldwide, with MOJO Magazine declaring her work as “stirring, vigorous,[and] grandly melodic”. With such great music being made within our own shores it’s easy, even with technology being as advanced as it is now, to miss out on what is happening elsewhere in the world. 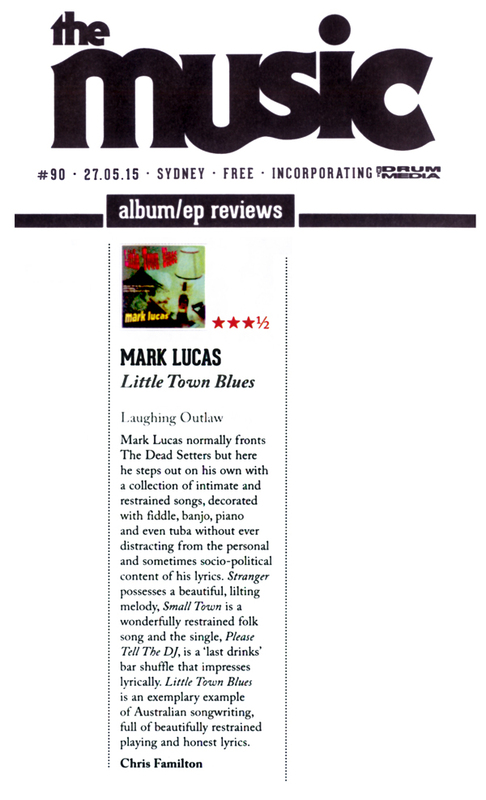 In the not so distant past there seemed to be a constant stream of exceptional albums coming from Australia’s Laughing Outlaw Records to remind us that there is a wealth of talent down there that really deserved to be checked out. Even now when thinking about the label a few names readily come to mind that defined the sound and vision of Laughing Outlaw. Perry Keyes was one; Jenny Queen, the Redlands Palomino Company were others, and then there was Sam Shinazzi. 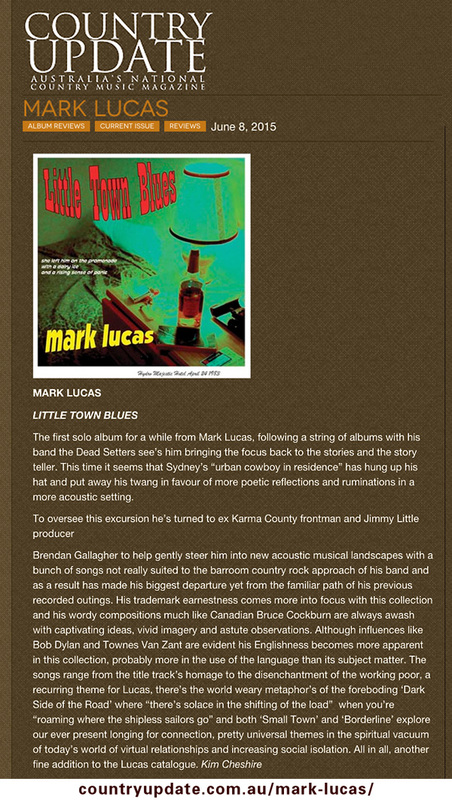 The first solo album for a while from Mark Lucas, following a string of albums with his band the Dead Setters see’s him bringing the focus back to the stories and the story teller. This time it seems that Sydney’s “urban cowboy in residence” has hung up his hat and put away his twang in favour of more poetic reflections and ruminations in a more acoustic setting. To oversee this excursion he’s turned to ex Karma County frontman and Jimmy Little producer. James Thomson is a wonderfully unassuming singer-songwriter with a calm and even energy that permeates through each song he sings. His songscapes are simple and old-school, and his influences range from alt-country to bluegrass. Despite Thomson being from Newcastle Australia his sophomore album “Cold Moon” feels like it belongs somewhere in the Southwestern United States; It has a real lonely desert feel to it. This is genuine, as the album was largely inspired by a trip Thomson took through this area. Thomson lists Bob Dylan, Robert Johnson, Woodie Guthrie, and Townes Van Zandt as major influences, and he does good job of channeling their iconic and simple Americana into the modern age. He pays homage to these folks by straying from ego or flashiness, and making this album about the songs rather than about himself. James Thomson’s debut album was an impressive calling card, a introduction to a talented songwriter already sounding beyond his years in terms of his songs and their lived-in delivery. The promise of that first sprawling collection of songs has been refined and stylistically expanded on the exceptional follow-up Cold Moon.